To my photographers and videographers, content creators alike, you all might be familiar with the family reunion scam. While most of us choose to ignore or delete scam emails, we decided to respond and see what the scammers were up to. Someone recently submitted a New Submission Form. This individual decided to complete an ‘expression of interest’ form through our ‘Contact Us’ page on our website. We were assuming that PPA was referencing to the Professional Photographer Association. Scams submissions or not, we make it a habit to respond back on the same day. Side note: we are making it a 2019 resolution to improve our response time to within the hour. While the sender spoke English, the use of commas, as a substitute for periods, in the first paragraph was a major red flag. Also, it wasn’t clear what company Ashley was representing. Typically, most corporate employees or brand ambassadors would have an email signature, reflecting the company that they work for or work with. When in doubt, ask for clarification. A few more red flags. In our limited time as a content creation company, we have never encountered a situation where the photographer paid the talent agency. 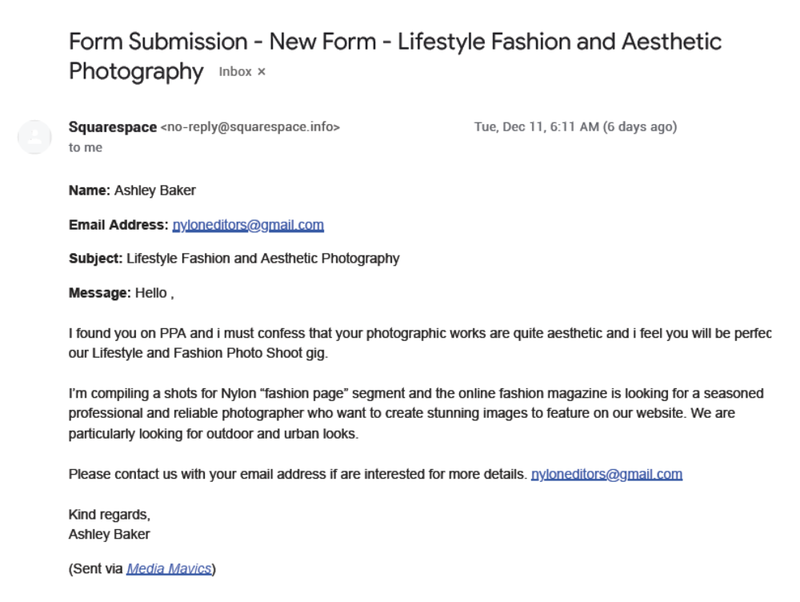 Once again, this email was riddled with awkward use of capital words - Models, Agency, Rentals. This led us to believe that this email was poorly manufactured from a mass email template generator. 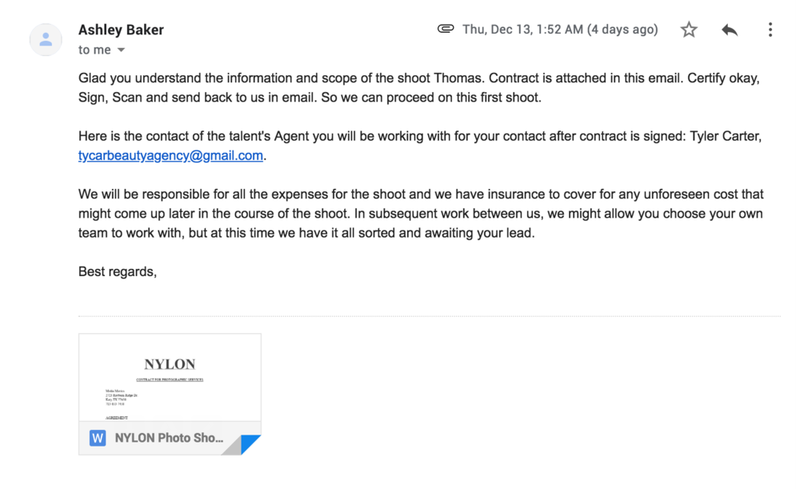 We were then connected with the talent agency, who was lead by Tyler Carter. Red flag: we tried googling the beauty agency and Tyler Carter, but he was nowhere to be found in Houston. At this point, it was difficult for us to believe that in this day and age, someone who is operating at this professional caliber (based off of the modeling agency rate) is no where to be found. And so we contacted the modeling agency. Once again, the use of overly formal and proper English was a red flag: “your choice of locations i believe should afford us great spots for awesome shots, be sure we will come prepared for the weather and all”. If Ashley had already spoke with Tyler, why does Tyler believe that we will do the photoshoot in a “clean studio equipped with air purifiers”. Is it possible that where Tyler resides, most studios are not clean and lack air purifiers? But we digress. At this point, we wanted to confirm our creative vision with Ashley. Mood boards are a great way to organize creative thoughts, and so we figured it wouldn’t hurt to ask Ashley if she had already created one for the photoshoot. Back to the payment, Ashley insisted that we ‘alert [her] when [we] received payment’. After reviewing the mood board, we thought that the graffiti park would tastefully match the vibe for Nylon. The check finally arrived in the mail, much to our surprise on an expedited delivery. But what was surprising was that the check was mailed from a person by the name of Alex Preches, based out in New York. It wasn’t clear what Alex’s relationship was to Nylon, or to Ashley Baker, or to Tyler’s beauty agency. Side note: If the check was mailed literally the next day, why did we not explore a Paypal or digital payment option? So many red flags here. Why would a Denver based Power Equipment Company give a check for a media production related deliverable? 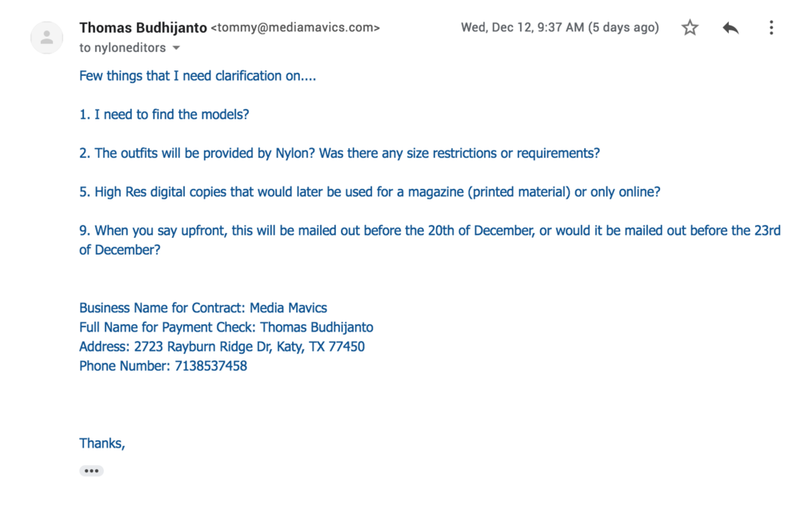 Wouldn’t the check need to be sourced from Nylon? Why would a Denver based Power Equipment Company mail a check from New York? And there it is, the last and final red flag. Why would the beauty agency (Tyler Carter) have a different bank account information? TLDR: if it sounds fishy from the beginning, it might be wise to act on your intuition. Always be on the lookout for scams. As the photographer, it shouldn’t be your job to forward money to anyone else. Also, if the typos seem to be reoccurring in places where it is typically out of context, then the email might be a scam. When you take a look at 2018 and compare it to years prior, it’s safe to say that our mobile phones are proverbially tied to our hips - we can’t seem to live without our phones. We depend on it for basic everyday tasks, such as navigating to our favorite restaurant or sending out an email, and even more cognitive intense tasks, such as mindfulness guided meditation. And with this shift, several companies large and small, have shifted their budget to advertise online. In the case of Heineken, 20% of their marketing budget was allocated for online and mobile (in 2015), with the goal to increase the online marketing budget to 50%. The challenge for Heineken was to translate what they know about producing highly creative TV ads and apply it to social and mobile platforms. What were some of their findings? Most people retain interest for 7 seconds, and most people watch up to 3 seconds. With more advertisers gaining experience in producing higher quality videos, they are able to retain more of the viewer’s attention. Up to 74% of the value is realized in the first 10 seconds. Historically, 30 second videos were the gold standard. But when we compare 30 second videos to videos of shorter length, we find that the overall completion rates also increase. Up to 72% of 15-second ads were completed, compared to 67% of 30-second ads. At Media Mavics, our proxy for a video’s resonance is measured by the completion rate percentage. The benchmark completion rate is 27%. We confirm the findings where shorter videos (sub 7-seconds) have a higher completion rate than videos of longer length. This also depends on the platform and purpose of the video. While short videos (sub 7-seconds) are optimal for Facebook ads and Instagram stories, short videos are not as successful on Linkedin or Youtube.